Cell electroporation is a complex phenomenon, which consists in the emergence of defects in cell membranes subjected to electric pulses. Since the end of the 1990s, biophysical models have been developed to explain and predict the conditions for cell electroporation. However the recent biological data, in particular those dealing with the influence of the repetition rate of the pulses, challenge these biophysical models. In this chapter, different approaches to model electropore formation are presented. The simplest equivalent circuit model is first presented. Biophysical approaches, which are extensively presented in chapter “Electropore Energy and Thermodynamics,” are rapidly overviewed. For each approach, advantages and disadvantages are also discussed, in terms of physical meaning and validation with the experimental data. Then phenomenological approach is introduced. Such approaches consist in designing the model on an empirical basis thanks to the experience. Even though the physical bases of such models are still lacking, they provide new interesting views on the electroporation processes, as described by the experiments. 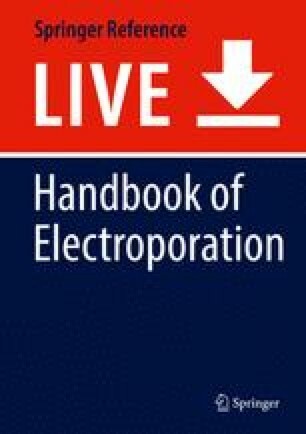 The aim of the chapter is to introduce the reader to different ways of modeling cell membrane electroporation and to provide some possible directions to obtain a more reliable theory of electroporation in accordance with the experiments and with a justified theoretical basis. This study has been carried out with financial support from the French State, managed by the French National Research Agency (ANR) in the frame of the “Investments for the future,” Programme IdEx Bordeaux, CPU (ANR-10-IDEX-03-02). Numerical simulations presented in this paper were carried out using the PLAFRIM experimental testbed, being developed under the Inria PlaFRIM development action with support from LABRI and IMB and other entities: Conseil Régional d’Aquitaine, FeDER, Université de Bordeaux, and CNRS (see https://plafrim.bordeaux.inria.fr/). C.P. is partly granted by the Plan Cancer project DYNAMO (9749 Inserm), and the Plan Cancer project NUMEP (11099 Inserm). C.P. is also member of the European lab of CNRS, LEA EBAM, on electroporation.